Cementation of Total Knee Arthroplasty (TKA) with polymethylmethacrylate (PMMA) remains the gold standard and most common method of TKA component fixation. The major cause of TKA failure is aseptic loosening of the tibial component necessitating revision surgery . Ever increasing numbers of TKA surgery performed make it vital to reduce the burden of subsequent revision procedures. In the United States, the recent growth in revision TKA (13.5%) was more than twice the growth in primary TKA rates (6.1%) . PMMA penetration into the cancellous bone of 3-4 mm prior to polymerization is considered ideal to attain adequate component stability by achieving microlock with at least one level of transverse trabeculae and sufficient curves in the vertical channels . Recently, multiple techniques have been described to maximize cement penetration depth and density in the proximal tibia during TKA. These modern cement penetration maximization techniques include the leg lift technique , timing of cement mixing(4), negative pressure intrusion , cement pressurization devices , pulsed lavage  and altered tibial tray undersurface morphology . Excessive cement penetration depth into cancellous bone during total knee arthroplasty has previously been recommended against  due to a possible thermonecrosis risk . 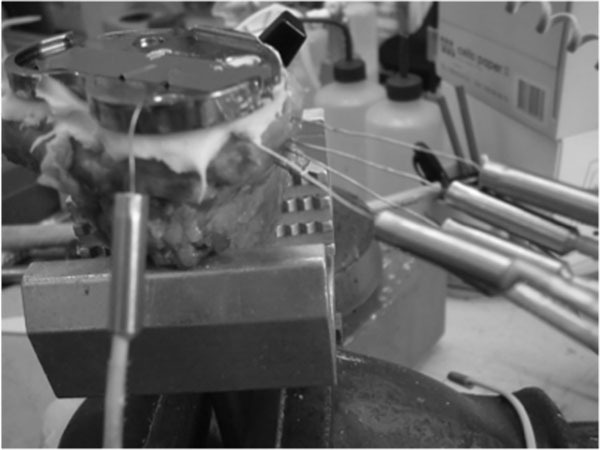 Seeger et al has shown that pulsed lavage leads to an increased femoral cement penetration without the risk of heat necrosis at the bone-cement interface , although minimal investigation into the thermal characteristics of polymerising PMMA in total knee arthroplasty using modern cementing techniques has been undertaken. The mixing of co-polymer polymethylmethacrylate powder with methylmethacrylate monomer to form crystal PMMA is an exothermic event , as 100 grams of monomer produces 13 kilocalories  of heat, which can produce in vivo temperatures of greater than 100 °C  in cement spacers and in vitro temperatures greater than 122 °C . Thermonecrosis of bone has been demonstrated in animal models  above temperatures of 53 °C when applied for greater than 1 minute, with bone remodeling occurring 3-5 weeks after the thermal event. Bone formation is reduced at temperature between 47-50°C for one minute leading to bone resorption and fat cell degeneration , while no significant effects are observed at 44 °C for 1 minute. Hence the extent of thermal injury to bone occurs over a narrow temperature range and is time dependent. Investigations reporting thermal damage to bone during total hip replacements has been well reported , however there is scant literature of the effect of modern tibial cementation techniques on maximum tibia temperature and time of thermal exposure. Thicker cement mantles as a result of modern cementation techniques could result in higher osseous temperatures [19, 20] during polymerisation. Due to heat dissipation, metal tibial trays should have a lower peak temperature than the all-polyethylene trays . Our primary hypothesis was that modern tibial cementing techniques, without component or cement pre-cooling would result in maximum cement bone interface temperatures of less than 44°C for one minute. Our secondary hypothesis was that higher average maximum polymerisation temperatures would occur with greater cement penetration and with the all-polyethylene tibias. Prior to tray implantation, four 2mm holes were drilled parallel and increasingly inferior to the cut tibial proximal surface from the anteromedial cortex. The initial hole was 1.5mm from the tibial surface, the second was 4.5mm, the third 7.5mm, and final hole was 12 mm from the proximal tibial resection (Fig. 1). All four holes were drilled to end at a position halfway between the cortex and stem position. Four single bare wire 0.5mm thermocouples were then inserted into the osseous holes. A type K thermocouple (Labeled Mantle) was placed onto the resected tibial surface so that once the tibial tray was impacted it was contained in the cement layer between the cut tibial surface and the undersurface of the tray (Fig. 2). A final thermocouple (Labeled Tray) was attached to the top of the tibial component with adhesive tape. The maximum temperatures recorded in all tibias was 37.76°C for the tibial trays, 48.03 °C for the mantles, 44.07 °C at 1.5mm below the resected surface, 39.81 °C at 4.5mm, 40.65 °C at 7.5mm and 34.41 at 12mm. All osseous thermocouples registered a temperature rise with cement polymerization, with an average temperature decrease of 0.67 °C per millimetre from the tibial surface. 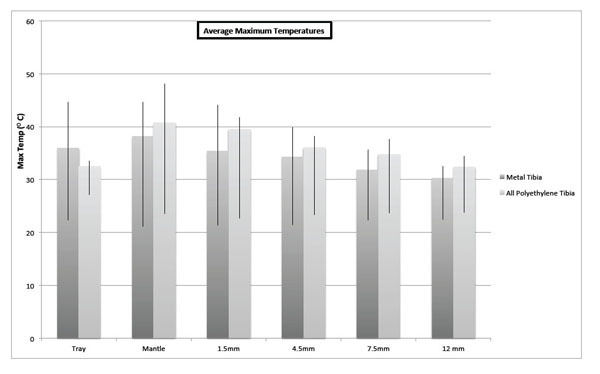 Average maximum temperatures and range in the tibial cadaveric models is detailed in both Fig. (1) and Table 1. Average maximum mantle temperature was 39.13°C (95% confidence interval ± 3.99). Average cement penetration in the metal tibia trays was 4.14mm (95% confidence interval ± 1.45mm). 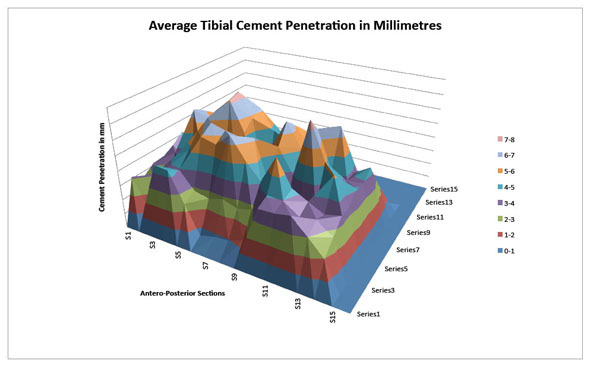 The average penetrations across each section are detailed in Fig. (3). A Pearson Correlation Coefficient Calculation (r=0.42) revealed no statistically significant correlation (p=0.48) between average cement penetration and maximum mantle temperature. The use of cadaveric tissue created some study weaknesses. Theoretically, peak polymerisation temperature is a function of volume to surface area ratio and the heat conduction properties of the local environment, such as implant material type and bone fluid content. The cadavers had varied water content, despite attempts to avoid specimens drying, this may have altered thermoconduction and may have contributed to some of the temperature variances. The cadaveric investigations were at room temperature as it was difficult to warm cadaveric tissue, and as a result peak temperatures may have been even higher if the tissues were at body temperature. Although, typically the proximal tibia is exposed to operating room ambient temperatures as a result of surgical exposure for an extended period of time during implantation. Cadaveric tissue obviously lacks local tissue blood flow, which could reduce maximum cement temperatures. However, most TKA are commonly undertaken without local blood flow around the knee due to the use of an arterial tourniquet , removing local blood flow as a heat dissipater. Hence our tibial cadaveric model represented a reasonable approximation of the proximal tibia during component implantation. As previously reported , thermal injury to bone is both time and temperature dependent, with temperatures at or below 44 °C reportedly not producing osseous injury but temperatures of 47-50 °C applied for more than one minute resulting in bone reabsorption and vascular injury. Bone reabsorption soon after implantation would lead to component migration and increased risk of failure. In none of the cadaveric tibias were temperatures above 44 °C for greater than one minute. However the thermal margin of safety was surprisingly narrow at an average 4.95°C, with two tibias recording temperatures greater than 44°C, one for 55 seconds and the other for 33 seconds. Roentgen stereophotogrammetric analysis of cemented knee arthroplasty suggests early component migration occurs soon after implantation. Increased early component migration is associated with later increased prosthesis failure, as for every millimeter increase in component migration there is an 8% increase in the revision rate . Pijls et al suggests migration of up to 0.5 mm is considered reasonable during the first postoperative year, while migration of 1.6 mm or more is undesirable. Previously described causes of migration include saw blade temperature induced thermonecrosis , direct PMMA cellular toxicity , and thermal injury due to PMMA polymerization temperatures  Due to these thermal injury concerns, prosthesis cooling , cement cooling , thin cement mantles , and PMMA chemical composition alteration to lower polymerisation temperatures during TKA have been suggested [27, 28] however tibial implants cemented with modern cementing techniques have results that are similar or superior to modern cementless tibias .